Consumers are ready to buy from companies that value kindness and social responsibility. We will promote your Greener Life Product(s) and you will stand a chance to Win a $100 or $400 Gift Certificate (we are giving away $9000 worth of certificates - click here for detail). Use the Greener Life Club Logo on you product labeling and website - see below. Greener Life Events Cocktails - Tapas - "Amazing Greener Life Environment"
SHOPPERS NEED TANGIBLE, RELIABLE INFORMATION ABOUT THE HEALTH, SOCIAL, AND ENVIRONMENTAL BENEFITS OF A PRODUCT AT THE POINT OF PURCHASE. 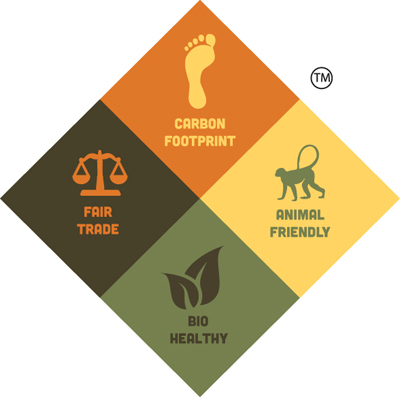 Greener Life Diamondtm Essential Depot aims to pioneer the tool that will make ethical consumption a habit in the soap & cosmetics marketplace. With so much to consider, how do we make the right choices? The Greener Life Diamond™ is a graduated certification system that shows whether a company is involved in processes toward sustainability. Ratings of 0 to 4 help consumers make responsible choices in purchasing. 0 - Cruelty-free and no impact on habitat. 1 - Cruelty-free. Minimal impact on habitat. 2 - Cruelty-free. Actively reducing habitat impact. 3 - Cruelty-free. Continued impact on habitat. 4 - No plan to address animal welfare impacts. 1 - Climate Friendly. Minimal carbon emissions. 2 - Engaged in carbon reduction. 3 - Future commitment to address carbon emissions. 4 - No plan to address carbon emissions. 0 - Skin Safe and Organic and Non GMO. 1 - Skin Safe and Organic. 3 - Possible Skin Issues. 0 - 100% fair trade and respect for indigenous land rights. 1 - 50% + fair trade and respect for indigenous land rights. 2 - Proactive with respect to fair trade and indigenous land rights. 3 - Investigating viability of implementing fair trade or indigenous land rights. 4 - No fair trade and/or indigenous land right activity. Click here to read the Greener Life Diamond white paper. "Greener Life Diamond" and "Greener Life Certified" are Trademarks of Essential Depot Inc. All rights reserved.